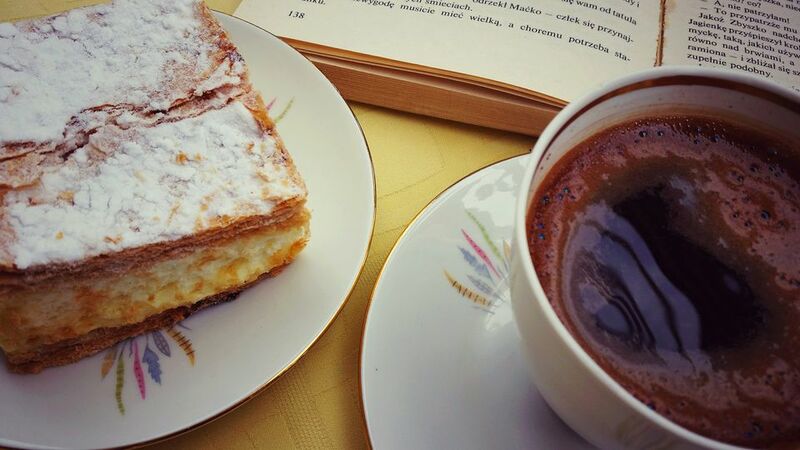 Slovenian prekmurska gibanica is a layered cake from the region of Prekmurje, Slovenia. Croatians have a similar version they call medimurska gibanica from the region of Medimurje. Sweet and savory (some use potatoes and cabbage but cheese is most common) gibanica (ghee-bah-NEET-sah) exist in almost every Balkan culture. Read more about gibanica. In this sweet version, I use poppyseeds, walnuts, apples, raisins, and dry curd cottage cheese layered between filo dough. Some versions call for a yeast dough, pastry dough base and honey instead of sugar. Mix the ingredients for each of the fillings in separate medium bowls until they are moist and spreadable, and set aside. Mix the sour cream topping ingredients in a medium bowl and set aside. Heat oven to 350 degrees. Lightly brush the bottom and sides of a 10-inch springform pan with some of the melted butter. Place 2 sheets of filo dough in the bottom and up the sides of the pan, letting it overhang (this will be cut off later). Lightly brush with butter and lay down two more sheets of filo dough and brush those with butter. Spread half the poppyseed mixture on the dough and lay two sheets of filo dough on top of it. Brush with butter and spread half the cheese filling on top followed by two more sheets of filo dough. Butter them and spread half the walnut filling on top. Lay down two more sheets of filo dough, butter them and spread with all the apple filling. Now repeat by laying down another two sheets of filo dough, buttering them and spread the remaining poppyseed filling on top. Continue in this manner until you have spread on the remaining portion of walnut filling. Lay down two sheets of filo dough and butter them. Place two final sheets of filo dough down and butter them. Cut off any hanging filo dough. (Use any leftover filo dough for appetizers or mini tarts.) Spread the sour cream topping over the gibanica. Place pan on a baking sheet. Using a long skewer, pierce the gibanica all the way to the bottom in several places. Bake 1 hour or until top is golden brown. If top is browning too fast, cover with aluminum foil. Store refrigerated, but serve at room temperature (or warmed) for best flavor.